Leading chemistry journal names WSU’s Jean-Sabin McEwen as one of the world’s most influential chemical engineering researchers. PULLMAN, Wash. – A WSU research team has developed a way to identify important chemical changes that occur during complex reactions on the surfaces of catalysts. PULLMAN, Wash. – Researchers from Washington State University and Tufts University have demonstrated for the first time that a single metal atom can act as a catalyst in converting carbon monoxide into carbon dioxide, a chemical reaction that is commonly used in catalytic converters to remove harmful gases from car exhaust. PULLMAN, Wash. – Washington State University professor and alumnus Yong Wang has won the American Chemical Society’s annual Industrial and Engineering Chemistry Division fellow award. A symposium in his honor will be held during the society’s national meeting in New Orleans in March. RICHLAND, Wash. – Researchers at Washington State University Tri-Cities have been awarded a National Science Foundation I-Corps grant to explore the market potential of their biojet fuel research. 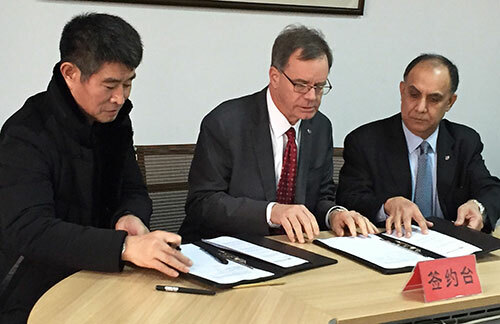 PULLMAN, Wash. – Washington State University has entered into an agreement with Shandong Chambroad Holding Co. Ltd., a private Chinese corporation, to educate WSU doctoral students to meet significant societal needs in energy and environment. PULLMAN, Wash. – Yong Wang, an internationally known researcher in catalysis and reaction engineering for energy and renewable fuels and chemicals, has been named a fellow of the National Academy of Inventors. PULLMAN, Wash. – Alyssa Hensley, who will graduate with a doctoral degree this month from Washington State University, recently received a national award so she could present her research about making biofuels more reliable. PULLMAN, Wash. – A researcher at Washington State University has received a three-year $450,000 federal grant to develop computer models for using iron to more efficiently refine bio-oils and make better biofuels. PULLMAN, Wash. – Norbert Kruse has been named an inaugural fellow of the International Field Emission Society (IFES) for his work in the development of catalytic processes for providing sustainable chemical feedstock under environmentally benign conditions using nanotechnology.